The first Picross game I ever played was on the Nintendo DS, which along with its autostereoscopic 3D-toting successor, was home to some of the very best entries in the puzzle series that melds PICtures and CROSSwords for your gaming pleasure. For those not in the loop, the origins of the Picross series go all the way back to 1995’s Mario’s Picross on the original Game Boy. While the series stretched its legs on the Super Famicom later that same year with Mario’s Super Picross, Nintendo has only released further series entries on the aforementioned DS and 3DS handhelds. And there have been some real barnstormers, too. DS stalwarts, Picross DS and Picross 3D are still regarded by many – myself included – as two of the best ever thinking man’s (and women’s) puzzle games ever to grace a Nintendo system. In more recent years, the series got a whopping eight mainline entries on 3DS (in the form of Picross-e through Picross-e7 and the seriously impressive Picross 3D Round 2), but Picross S on Switch is the first time the system has appeared on a home console (yes, yes, I know Switch is a handheld, too.. but more on that in a bit) in twenty-three years. Gulp! Right then, despite giving a history lesson in the series, I’m going to assume that you guys know how the Picross games play, and from here on, will ascertain just how good or bad ‘S’ is. For starters, if you don’t how to play Picross, series developer, Jupiter have laid on an awfully welcoming tutorial that will get even the slowest among us up and running in a jiffy. Seemingly also with L-plate Picrossers in mind, there’s a bunch of buffers on offer to get you out of a bind, including a roulette wheel of sorts that will automatically fill in a couple of lines on your grid. Another option will highlight any incorrect rows to stop you getting yourself in a pickle. There’s even an auto-correct so you don’t go through your puzzle with any incorrectly fills squares. Yep, it’s a veritable beginner’s bazaar! What that in the back, you’ve been playing since the nineties? Well, it pains me to say it, but perhaps Jupiter is based on the planet of the same name, because your cries have not been heard. Aside for a Mega Picross Mode that gives increased the number of puzzles on offer (from 150 to a whopping 300) and their complexity, but they still aren’t overly taxing. But most bizarrely, in testing, I didn’t come across any penalties for checking incorrect boxes. As someone who has always enjoyed the challenge of 100% error-free puzzle completion, this is a shame. However by way of reward for completing all puzzles without assists, there is a badge to unlock. I know, right? Big whoop! There aren’t really any bells or whistles to make the package feel special either. As mentioned earlier, this is the first home console Picross title since the Super Famicom days, but in bringing it to the living room TV, the developers have seemingly forgotten about those of us who play our Switch in the palms of our hands, because there’s no touchscreen support whatsoever. I know Nintendo has dropped stylus support for Switch, but come on Jupiter, we have an instrument that can’t be left on the bus; our bloody fingers! *Steadies breathing. In remembering its sharing capabilities, there is a Co-Op Mode for Switch owners, but it isn’t anything to base a roof-top garden party around. I know I’m wailing on Picross S a little here, but this is mostly down to those previously discussed illustrious forebears. Standing on its own two feet, Picross S offers a polished product with more of the same great puzzles we’ve come to expect from the series, but it could have been so much more. 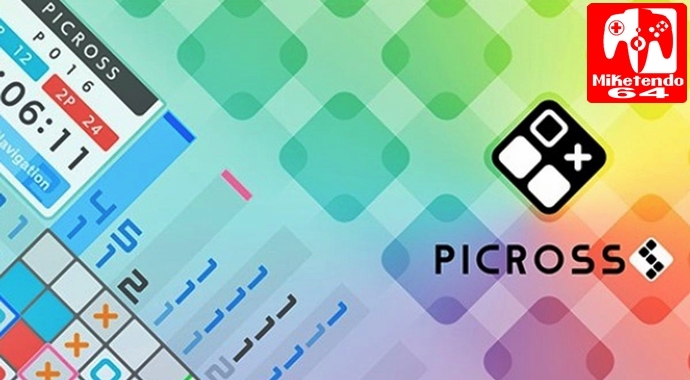 While it can’t match it for character or charm, Picross S joins the likes of Piczle Lines DX as a competent, eShop puzzler that is sure to please the uninitiated and portions of the Picross faithful alike. It is with that in mind, that I give Picross S a solid recommendation. Just don’t go in expecting Jupiter’s Switch debut to blow your socks off in the same way as its DS predecessors.